« Review: figma 034: Suzumiya Haruhi Summer Seifuku ver. From what I’ve seen around the net, the figure I have up to review today is Hiiragi Kagami Cosplay ver. Here we have Hiiragi Kagami from the Lucky Star OAV dressed up as Hatsune Miku. Kagami here comes with a standard set of accessories. First and foremost is the usual 3 jointed stand and base. She comes with an extra face that basically makes her look annoyed, so nice! Also, she comes with 2 leeks just like Miku, but designed like it came out of the Lucky Star universe. Kagami’s twin tails are equipped with figma joints, just like Miku, and are considerably larger than the Winter Seifuku Kagami. 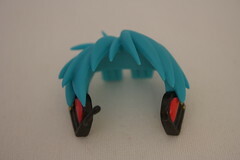 Unlike Miku, the headset is attached to her bangs, so they come off neatly when you remove them to do any face swapping. Pros: Bonus face. Looks great on Original Kagami. Happy face from Original Kagami looks fantastic on Cosplay Kagami. 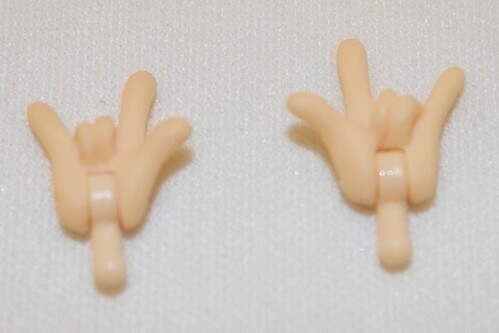 Accessory hands. 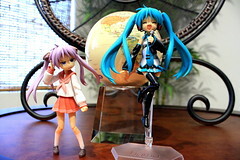 Now Lucky Star figmas can use items such as Raising Heart and Bardiche. *Kira* hands. This is the first unique hand I’ve seen since the bonus blade hand that came with Asakura’s figma. 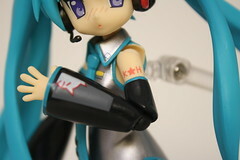 The figma joints in her twintails. A little extra care to support the massive hair she has is always nice. Attaching the headset to the bangs. 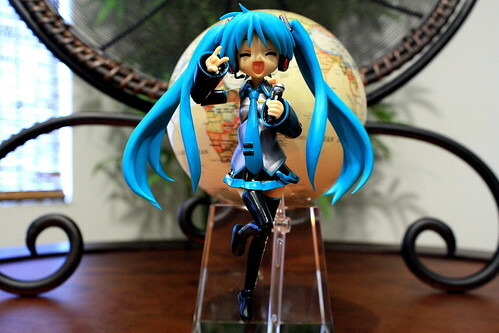 I was always paranoid with Miku’s face swapping, since the headset on her figma was attached to the head, meaning you needed to be extra careful when face swapping, lest you snap off her boom mic. Cons: Many have complained that Kagami looks a little chunky in this figma. The reason for this is because the dress is a little too long for her, and the skirt spreads the bottom of the dress, making her look like she’s put on a few. Actually seeing the figma, she really doesn’t look fat at all. The only other complaint I have is with regards to her tatoo, which is turned more towards her back when her arm is in a neutral position. If you really want to see that tatoo, you need to twist her arm over in a strange position. Again, it’s not really a huge complaint, especially considering the amount of pros in this figma. 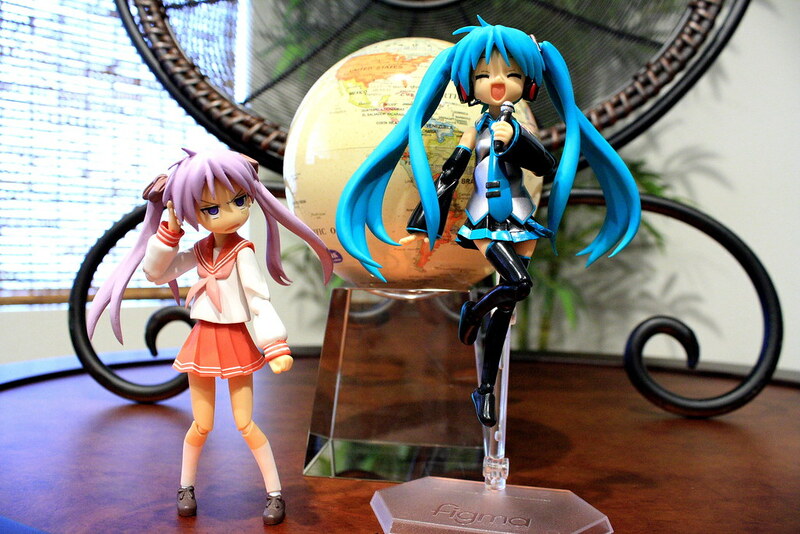 Lucky Star fans should definitely pick up this figma. 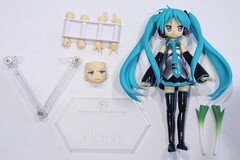 Vocaloid fans that like Lucky Star might want to pick this up as a ‘little sister’ to their Hatsune Miku figma. 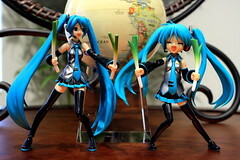 Leek lovers should fly to japan and pick up 5 ;) It only seems like this figma doesn’t come with much, but once you see those 4 unique hands and that pissed off face, you’ll change your mind! Hiiragi Kagami Cosplay ver. can be found for ¥2,261 at Hobby Search, and ¥2,381 at Hobby Link Japan. *Kira*!